Keep your poodle's snout and eye area trimmed short to make tear stains easier to treat. If your pretty white poodle looks like she's been crying her eyes out, don't despair. She's not heartbroken. Her eyes are tearing and staining her fur, a condition she shares with many canine comrades. This is usually not a serious medical issue and can be contained with consistent care. If your pup's tears consistently overflow onto her face and stain her fur, she might have a condition called epiphora. The tears contain a pigment called porphyrin, and over time, the pigment will dye the fur red-brown. 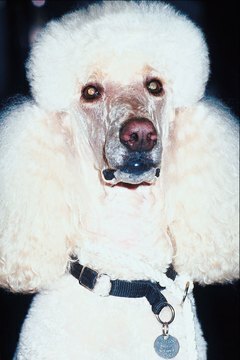 The tears can cause staining in any breed, but it is common in poodles. It is most evident if your dog is white or light-colored. Tearing can have a temporary or chronic origin. In the short term, dust, allergies or ear infections can make your dog's eyes water. Genetic predispositions such as shallow eye sockets or blocked tear ducts also can cause tears to drain onto the fur. Check with your veterinarian to rule out more serious causes, such as glaucoma or an eye infection. You can prevent some tear staining if you eliminate things that irritate your pooch's sensitive eyes and make them water. Trim long hair so it doesn't fall into her eyes. When you bathe her, make sure to keep soap suds out of her peepers. Check her eyelashes to ensure they are growing properly and not causing inflammation in the eye. Inspect her eyes for foreign objects and use clean, warm water to flush them out. She may love to hang her head out the window when you go for a drive, but don't let her do it. Debris is likely to fly into her eyes. Tear stains can be stubborn, but consistent attention can keep them at bay. Clean your pup's mug daily to prevent stains from forming. Use warm water to gently wash the corners of her eyes. If the fur is already streaked a reddish-brown ask your vet and groomer to recommend specialized products that help remove tear stains. Ask your vet about the effectiveness of medications to reduce or eliminate tearing. In some cases, surgery is an option to improve tear drainage problems and other eye conditions that may cause tear overflow and staining. Always consult an experienced veterinarian regarding the health and treatment of your dog. At What Age Do Kittens Eyes Change Color? Can Dog Food Stop Weeping Eyes? How Does a Cat's Hair Stand Up?